The ocean consists of a vast pool of marine life and more species of Earth’s life forms live underwater than on land. In fact, there are countless types of sea creatures that have not yet been discovered and mankind has just scratched the surface in terms of discovering new species underwater. However, everyone has heard of squid and jellyfish but some people might not know the difference between the two marine life forms and some people may assume they are related species. In fact, to the contrary, squid and jellyfish are totally unrelated and belong to different species classifications all together. 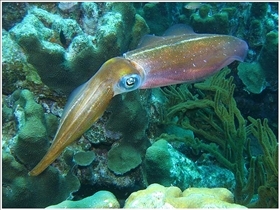 The squid's main body is packed into a mantle, which also consists of a fin, However, unlike other sea organisms, they are not primarily used for swimming. The squid's skin is covered with chromatophores, which gives the squid the unique ability to change its skin color thus enabling him to blend into his surrounding which can fool even the best of us. On the other hand, the jellyfish have a completely unique and different anatomy from the squid. Jelly fish don't have a nervous system. In addition, they also do not have a digestive system and don't need to breath like other organisms since their skin can breath oxygen for them, employing a process called diffusion. When it comes to eating squid, many people around the world as well as a good number of those on the Asian subcontinent have eaten squid. It is popularly served as fried, raw, in a soup, stir fried and many other varieties. On the other hand, eating jellyfish is not common around the world and a majority of jellyfish are poisonous, making them lethal if consumed. 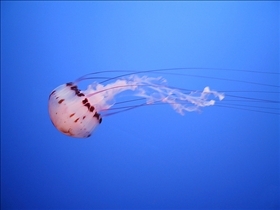 Nevertheless, the scyphozoan jelly fish are commonly consumed in Southeast Asia. In addition, the cannonball jellyfish is popularly consumed in the U.S. since it's poison is not harmful to humans. The squid basically has two defense mechanisms which help it defend it self from predators, it's first defense mechanism is changing it's color so that it can blend into it's surroundings. If that fails, the squid can squirt a blinding ink as it flees, however the ink is not poisonous and is mainly used to blind the predator temporarily. On the other hand, most jellyfish have a very lethal defense mechanism. Jellyfish have poisonous tentacles which can latch onto the skin and deliver a painful and sometimes deadly venom to humans if treatment is not administered in due time. The ocean consist of countless sea creatures, that man has yet to discover. Jellyfish and squid are two distinct species of sea life contrary to some beliefs. The squid has a central nervous system, a digestive system, and has the ability to change its skin color, while a jellyfish does not have these abilities and can only breath through it's skin. Thus a jellyfish is quite a simple creature. Consuming squid is quite common and most people in their lifetime have eaten squid. Eating jelly fish is rare around the world and only a few species can be consumed by humans. The squid can hide very effectively by changing its color and fooling predators easily. If that fails it can squirt a blinding yet harmless ink. A jellyfish can deliver a very painful sting, which can be deadly to humans. Which sea creature looks weirder?